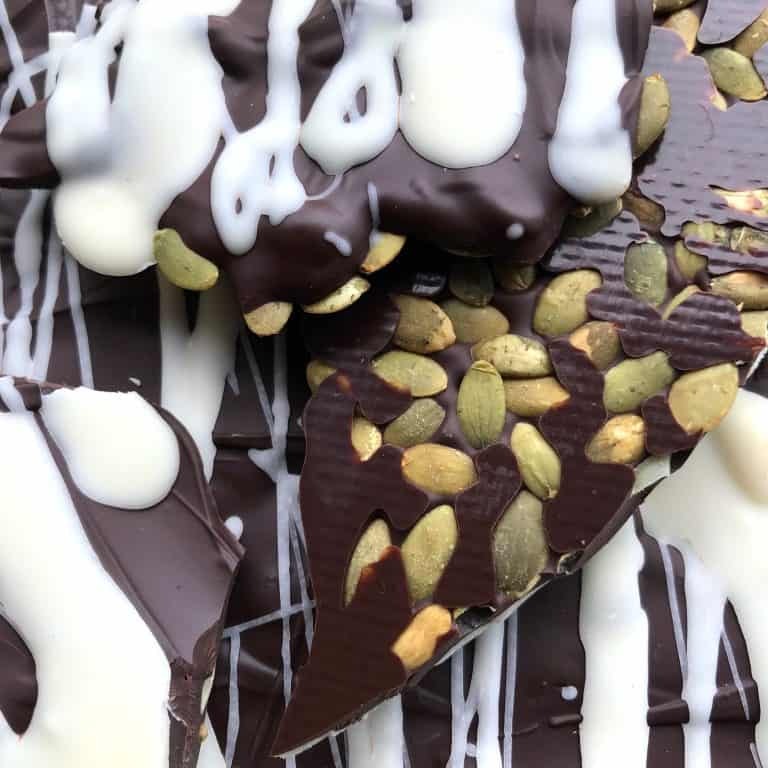 Sweet with a hint of salty, smooth and crunchy, addictively delicious…these all describe this incredible quick and easy Chocolate Pumpkin Seed Bark that will make you smile every time you take a bite! 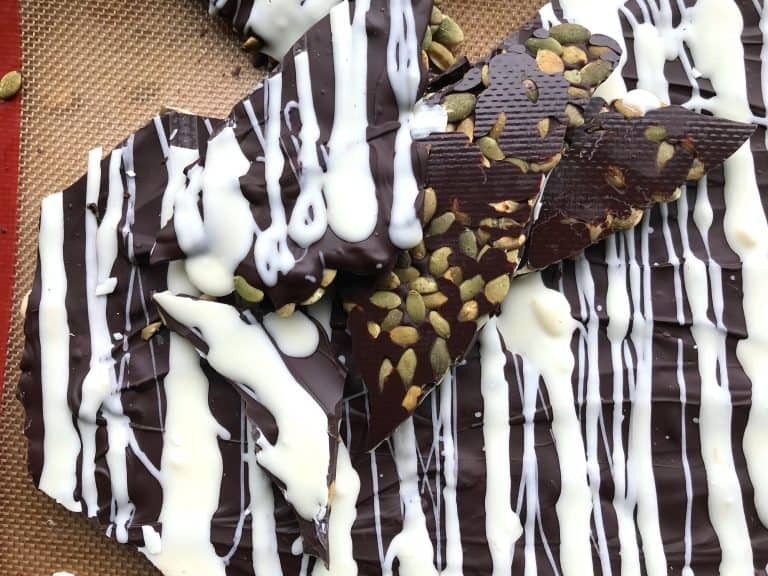 It all started with a bag of pumpkin seed Bark Thins. I was eating low carb to shed a couple of holiday pounds but needed an occasional “something” I could indulge in – however small – for the psychological boost (translated as “to stay sane”). Dark chocolate, no added sugar…a couple of small pieces was my ticket to momentary bliss. 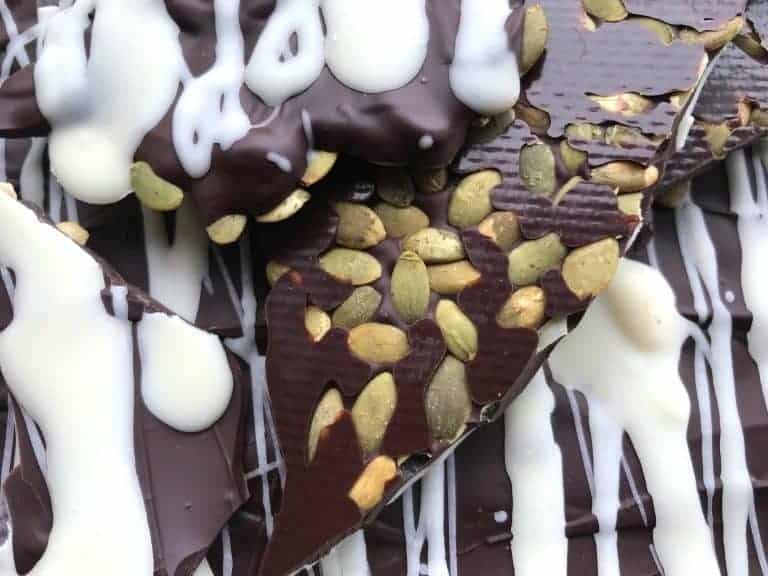 It got me through to my goal and I’ve been hooked on chocolate pumpkin seed bark ever since. So I decided to make my own. 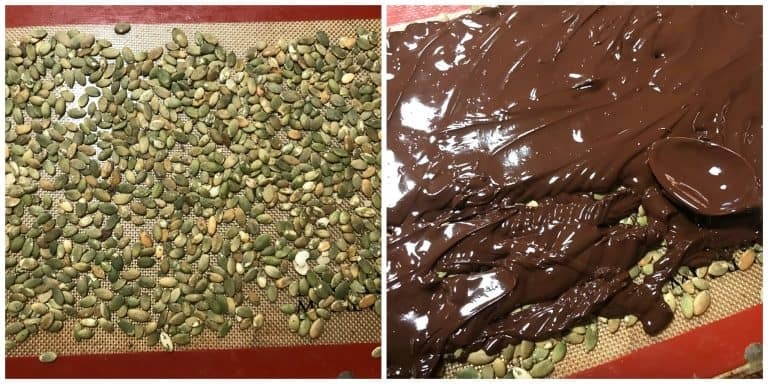 Nothing to it: Just toasted pumpkin seeds and melted chocolate. It couldn’t be any simpler and the results are addictively delicious. You can use any chocolate of your choice. Dark of course has the lowest sugar content. But you can use milk or white chocolate. 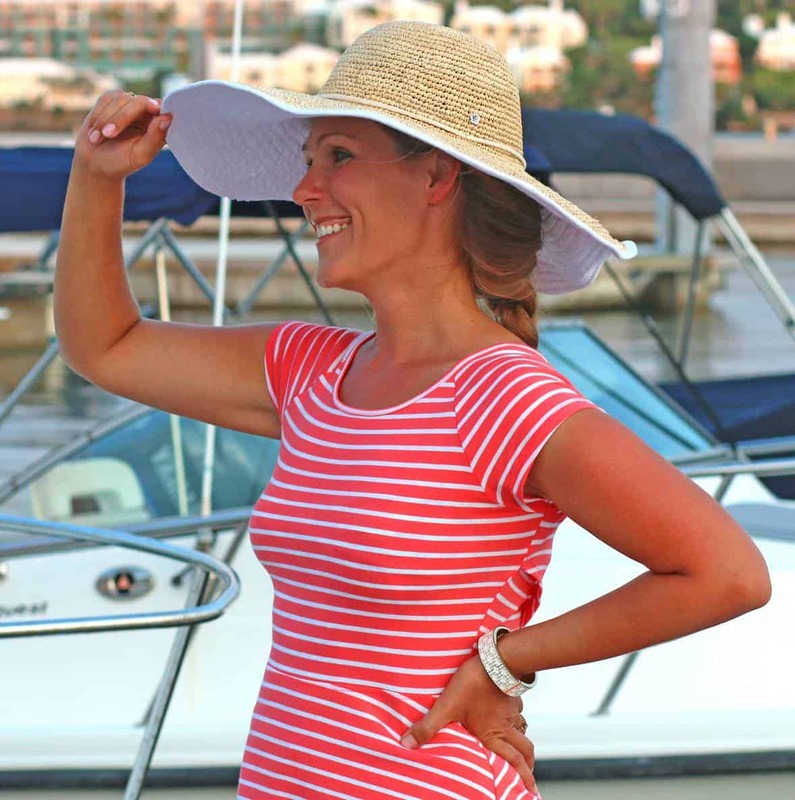 Or a combination as I did this time for these pics. And of course you can customize in any other way you like: Use different seeds, toasted nuts, maybe add a few raisins or dried cranberries. Whatever tickles your fancy. 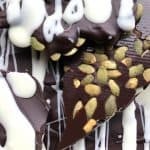 This chocolate pumpkin seed bark is very easy and very quick to prepare and it makes the perfect gift, whether you need something planned or last minute. Put the tray in the fridge or freezer and the chocolate will be set within minutes. Then you can bring it to your friend or family member and watch their eyes grow wide when they open the package. Of course that’s if there’s anything left of it by the time you give it away! 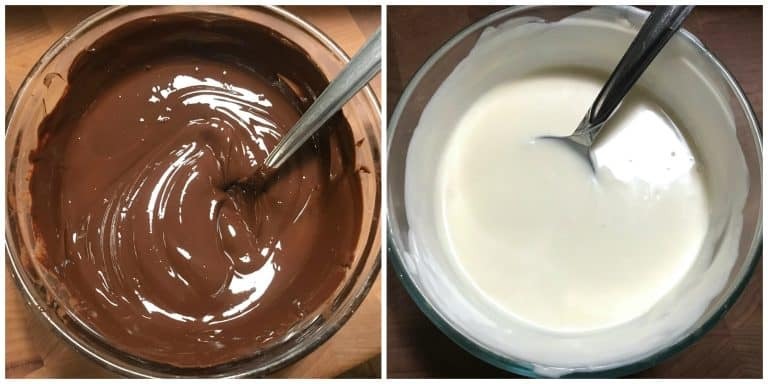 Place the chocolate in a microwave safe bowl and microwave, stirring frequently, until melted. If using white chocolate do the same but wait until after you’ve spread out the dark/milk chocolate. Spread the pumpkin seeds out onto a silicone mat, parchment or wax paper on a large cookie sheet. Pour the chocolate across the pumpkin seeds and use a spoon spread chocolate into an even layer. Allow the chocolate to sit for a couple of minutes and then drizzle the melted white chocolate over it (if using). Chill the chocolate to set and then break it into pieces. Store the pieces in an airtight container in the fridge for up to a couple of weeks. At cool room temperature they’ll keep for about 10 days. 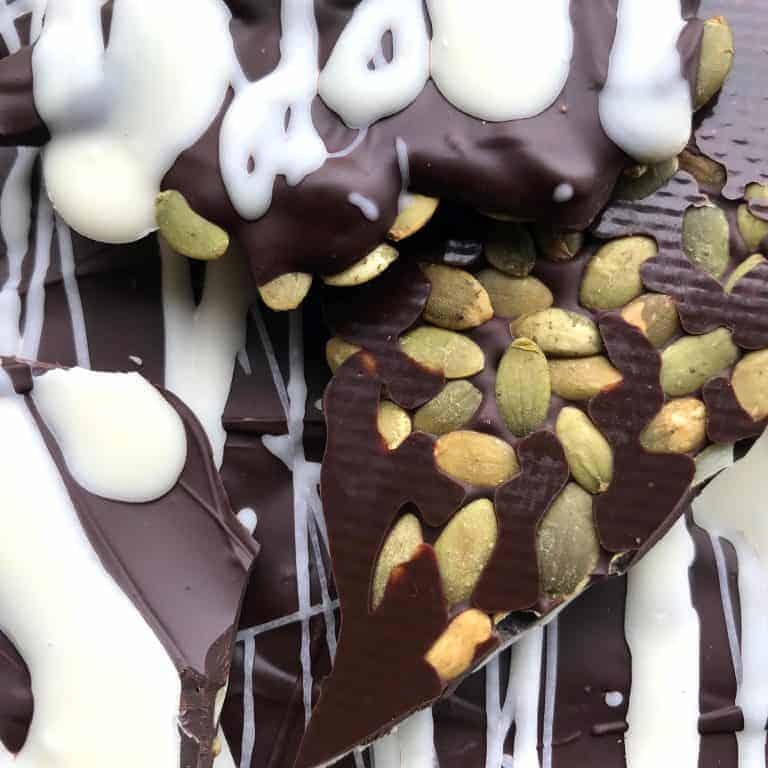 Sweet with a hint of salty, smooth and crunchy, addictively delicious...these all describe this incredible quick and easy Chocolate Pumpkin Seed Bark that will make you smile every time you take a bite! Place the chocolate in a microwave safe bowl and microwave, stirring frequently, until melted. 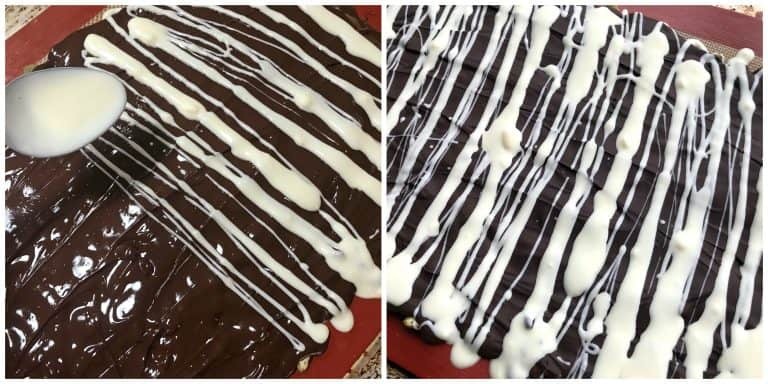 If using white chocolate do the same but wait until after you've spread out the dark/milk chocolate. Chill the chocolate to set and then break it into pieces. Store the pieces in an airtight container in the fridge for up to a couple of weeks. At cool room temperature they'll keep for about 10 days. 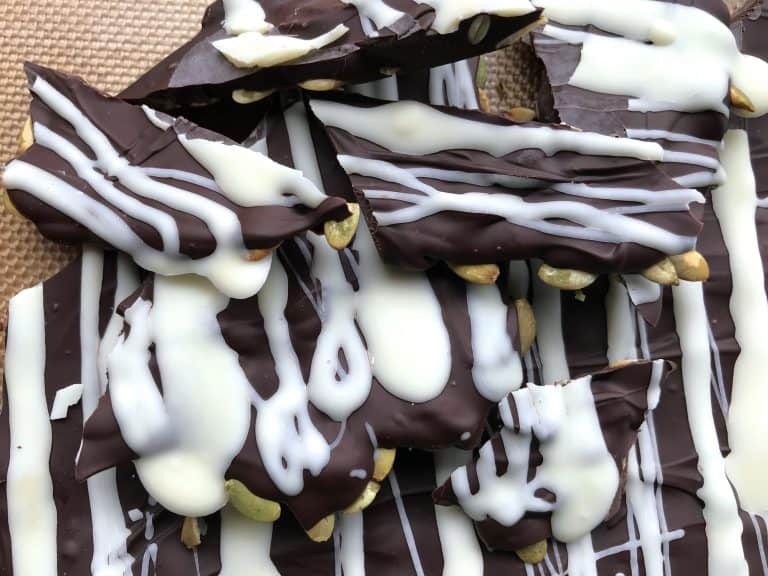 I am obsessed with this chocolate pumpkin bark! A perfect snack in my book! I JUST bought some pumpkin seeds! So excited for this recipe! Delicious dessert to curb my sweet tooth without feeling too guilty with all the protein in those pumpkin seeds!! Love this recipe!!! What a great snack! Love pumpkin seeds and I am pretty sure I have them in the house right now! YUM!! Love the sweet and salty combo! Oh boy, this looks terrific!! I bet it tastes aaahhmaazing!! Chocolatese makes everything better. This sweet and salty combo is perfect. Oh my goodness! I’ve never tried this but it seems an awesome idea! I love pumpkin seeds all year long, however, what makes them better is smothered in chocolate. I have never thought of this. I can’t wait to make it over the weekend. I love this for a snack option for this week! I have to make it up! This is absolutely amazing!! My kids will surely love this!